One of the features that bring each Irish contemporary painting to life is the artist's use of light and shade. It adds depth and interest to the painting. 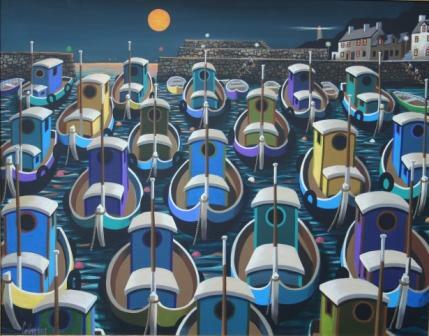 Irish artist Cormac O'Leary is just one example of an artist whose contemporary art paintings are characterised by careful use of light and shade. In order to fully appreciate the light and shade of your Irish art and paintings it is important to use external light to enhance and illuminate the art. Good lighting can make a great difference to viewing a contemporary painting. Even slight differences in direction or type (fluorescent, incandescent, halogen, natural, etc.) can make all the difference. Proper lighting of Irish Art will bring out nuances and effects in your Irish paintings that you might not have seen before. Also it will tend to bring out the artwork, in terms of importance in the design of a room or environment. Often contemporary paintings are hung where there is a convenient space without enough thought about the lighting of each art work. In addition to the light and shade depicted in any Irish painting there is the actual light, shade and texture that is often created by the Irish artist's use of paint or other media. This is often apparent when comparing a contemporary painting in reproduction with the 'real-life' painting. The difference can be astounding in terms of seeing the brushstrokes and marks made by the artist in creating the painting. 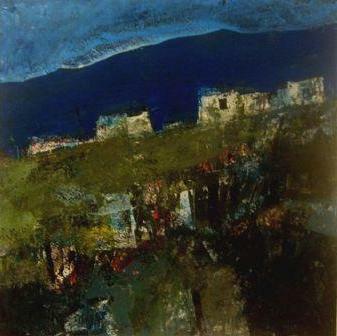 It is this 'real-life' texture and connection to each Irish contemporary artist that makes owning original paintings so special. 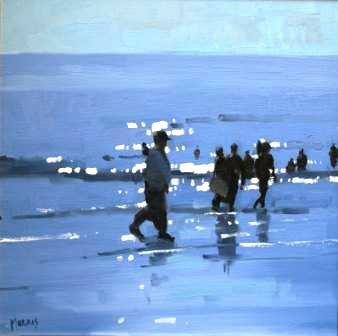 Irish contemporary artist John Morris, for example, undertakes his paintings out of doors and this immediacy and strength is reflected in the way the artist applies paint and uses strong brushstrokes. Sometimes there is enough natural light in a room to show off a contemporary Irish painting but natural light is very inconsistent and can be damaging to art, particularly Irish paintings, Limited Edition Prints and art works on paper. The infrared and ultraviolet (UV) rays of natural sunlight can damage works of art. UV rays are so harmful that it can, over time, fade works on paper especially pastels, prints, photographs, and watercolours. Modern paints are more resistant to fading but care should still be taken to protect your art investment from overexposure to unlimited sunlight. Irish Art and Irish paintings need to be protected from light damage. First of all, don't light your paintings and prints all and every day. If you wish to be extra cautious only light the contemporary art when you are viewing it and keep the light off at other times. The most common Irish household light bulbs (incandescent lights) bring out the warm colours within the spectrum. This means the red, brown, orange, and yellow tones in contemporary Irish paintings will be enhanced. The blues, greens, and violets within your works of Irish art may be flattened out by incandescent lights. So, these lights are better than natural or fluorescence for contemporary art works and paintings but are not the entire solution to the lighting problem. Fluorescent lights do not emit light across the entire spectrum of colours and produce a harsh glare and are therefore usually unsuitable for illuminating Irish art works. The strong white light of halogen makes it among the best lighting solutions for illuminating Irish art and contemporary paintings if installed properly. A low watt halogen light may work well. Halogen light allows the subtleties of colour to come through in paintings. A low watt halogen-based bulb has been recently introduced which redirects damaging UV and infrared rays of light. Once again, the use of a halogen light at low wattage may prove best for most works of Irish art. Whichever lights you choose to use to light your Irish contemporary art do remember not keep contemporary paintings on display for long periods of time since all light (natural and artificial) is damaging to works of art and will devalue your art investment over time. Direct lighting systems are also not to be recommended for lighting an artist's work. A compromise is necessary when lighting contemporary Irish art. This doesn't mean go out and purchase all different types of art lighting, just light your paintings wisely. Try to avoid the UV and infrared rays from directly hanging works of Irish art in sunlight. Don't shine a bright light of any kind directly onto artwork, especially works on paper. Remember, photographs and works on paper are most fragile.